A lot of people living with disability have a tough in the bathroom. However, when you have the quantum Bath Chair with Commode you have every reason to confidently get into the bathroom and take your bath in total comfort. And the good news is that you can take this chair with you wherever you may go. Sportaid offers you this and other amazing products; I will let you know the features of this bath chair in a moment. The Quantum Bath Chair has been built for durability. 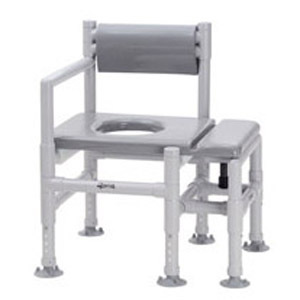 The commode hole style seat is internally rounded and covered in foam to ensure your comfort. You can either access the bath chairs using the right or left entry, the chair has a reversible left or right side entry. The assembly of this chair is simple; you do not need tools to put it together. It has a weight capacity of 350 lbs, an ideal choice for everyone.